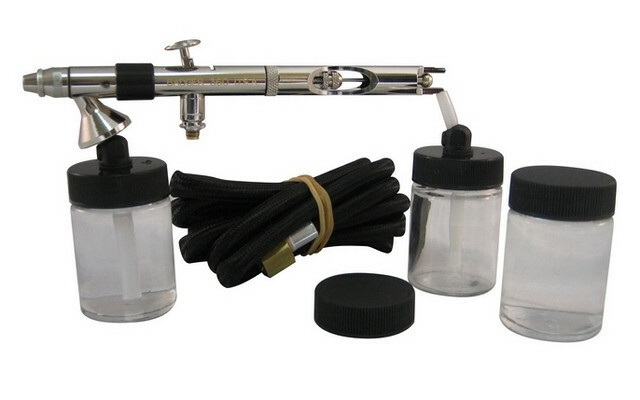 The Universal 360 provides the user the convenience of two airbrushes in one for the Ultimate in Versatility! The Badger Model 360, "Universal" is both a gravity and bottom feed dual-action, internal mix air brush. The Universal is the only airbrush capable of performing in both gravity feed and bottom feed modes. 360 Degree front end rotation to allow for either gravity or bottom feed. Single nozzle/needle sprays from pencil lines to 3" (76mm) spray pattern. Single size nozzle/needle design for spraying all materials. Easy access needle assembly. Finger tight assembly tolerances. Correct weight apportionment balance system. Ultra comfort, ergonomically correct trigger cushion.